"Any observatory is only as good as its telescope and any telescope is only as good as its primary mirror". However there are a thousand things that can make a telescope under perform. 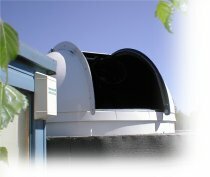 The challenge is to make a telescope that is as good as its primary mirror. Obviously throwing large amounts of money at the project would probably work! However unless you are building a large orbiting telescope some compromises are in order. My priority was for good tracking and go to pointing that could be used with a ccd camera left in place. So I bought 14" worm wheels and the bushes and bearings to go with them. The rest of the scope was pretty much DIY. 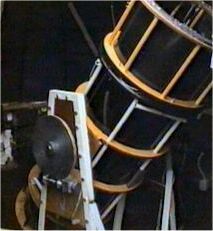 The base is similar to a dobsonian and the alt bearings are held on an angle iron frame with wood inserts. 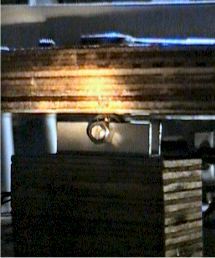 This wood helps to damp vibration associated with welded metal mounts. 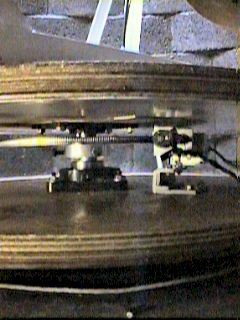 The turntable is supported by 3 bearings riding on a aluminum disc. 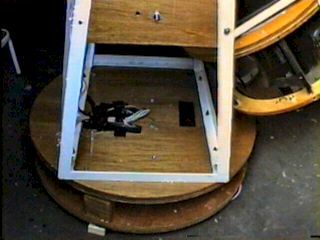 The central shaft is hollow to take the wiring and has the worm wheel fixed to it. Copyright ©2002 Your Name. All Rights Reserved.